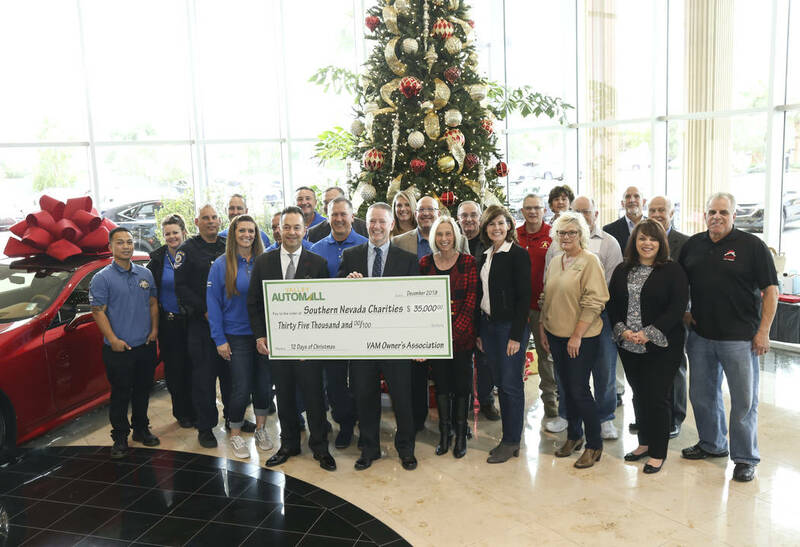 The Valley Automall’s annual “12 Days of Christmas” presented an early Christmas on Dec. 7 when the Valley Automall Owners Association donated $2,500 to 14 local charities at ceremonies presented in the showroom of Lexus of Henderson. The $35,000 in donations was met with open arms by the charities throughout Southern Nevada. The list of recipients included the YMCA; Injured Police Officer’s Fund; The Shade Tree; Nevada State Veterans Home; Hope Link of Southern Nevada; Veteran’s Village; Grant a Gift Autism Foundation; Family Promise of Las Vegas; Boys &Girls Club of Southern Nevada; Candlelighter’s Childhood Cancer Foundation of Nevada; American Red Cross of Southern Nevada; SAFE House; Emergency Aid of Boulder City; and Youth Charities of Southern Nevada. Chuck Searle, development director of the YMCA of Southern Nevada, said his group has worked with the Valley Automall for the past seven years. “Those dollars go toward our annual campaign which raises funds throughout the year for scholarships and financial assistance for those individuals and families that cannot afford it,” he said. “Then, our members are able to participate in programs while also using the facility through their membership. Valley Automall Owners Association General Manager Al Shirley said the annual drive started in 2014. Jim Ludwig, the regional philanthropy officer for the American Red Cross, praised the Valley Automall. The Valley Automall’s program also drew high praise from Terri Janison, the president and chief executive officer of Grant a Gift Autism Foundation, which is involved in a partnership with the UNLV School of Medicine. Findlay CFO Tyler Corder serves as president of the American Red Cross, which has become his favorite charity. Corder saluted the Valley Automall’s continued efforts to help others.